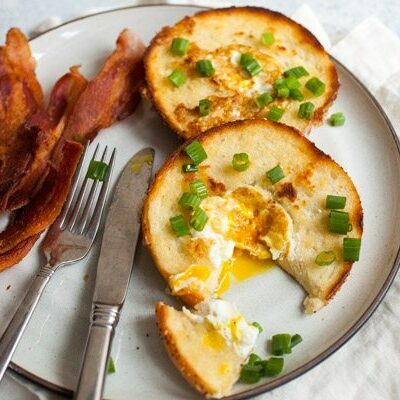 Egg Muffins are an easy-to-make breakfast recipe. They’re delicious too! Watch the video showing you how to make this recipe, then scroll to the bottom of this post and print out the recipe so you can make it at home. Hey, it’s weekend breakfast time! By now, I’ve explained extensively how I feel about weekend breakfasts. Shove the cereal aside and make something special! Saturday and Sunday are your two days not to be stressed-out and tired. Sleep in, put together some sort of tasty breakfast, and get on with your relaxing day, right?! I have such a variety of breakfast recipes to make here on RecipeGirl. My favorites to make on the weekend are muffins and pancakes. But during the week, I’m looking for something a bit more healthy. I like to make a double batch of Egg Muffins on Sundays so I have them around for a few days during the week. They’re so easy to grab and go! 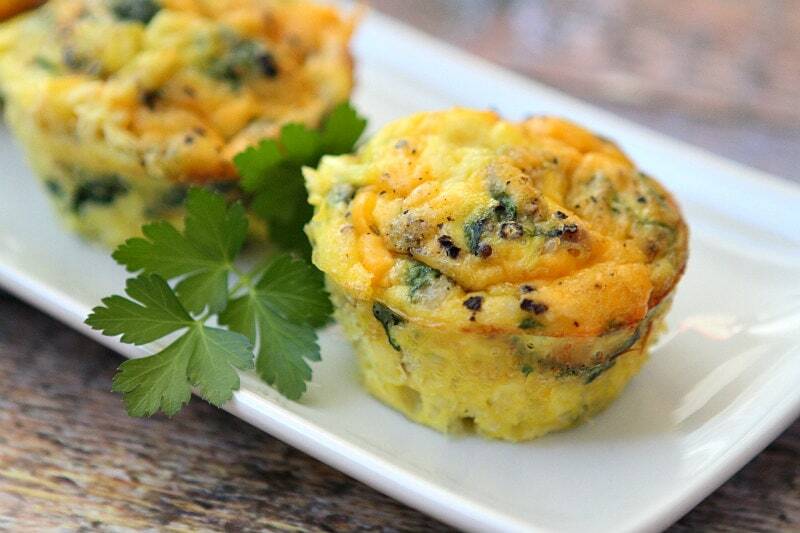 Can you make these egg muffins ahead of time so you have egg muffins to eat all week long? Absolutely! You can keep them in the fridge for 4 to 5 days and just briefly re-heat them in the microwave when ready to eat. Some people have mentioned freezing them. The best way to handle frozen egg muffins is to pop a frozen muffin in the refrigerator the night before eating so it can defrost overnight. Then pop it in the microwave for 30 seconds the next morning. If you didn’t have time to think ahead, you can certainly heat them in the oven to warm them up again– or use the microwave in short bursts until they defrost. How do you make Egg Muffins? These little egg muffins aren’t any kind of chore to make at all. 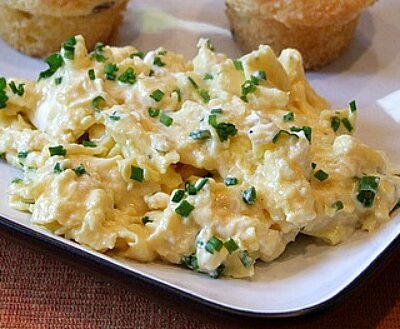 They’re just eggs scrambled with a little milk and adding in your desired fixings. I clean out my fridge for these guys and use sausage, spinach and the last of my shredded cheese. 30 minutes in the oven… while you make the coffee, flip on the TV to watch Netflix or recorded episodes of Shark Tank or The Walking Dead (favorites in our house!) Then your egg muffins are ready to eat. We serve ours with a scoop of chunky salsa. They’d also be good with some sour cream and/or (GASP!) ketchup. That all depends how you like to adorn your eggs. If you’re not into spinach, you can certainly throw some broccoli pieces in there or bell pepper. Crumbled, cooked bacon would be awesome too. 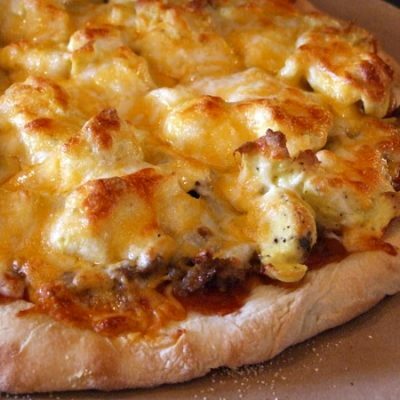 Use whatever cheese is your favorite. There are so many ways you can make them! If you want to lighten up on the eggs, it’s okay to use half egg whites and half whole eggs. I have a small family, so we just made 6, but you can certainly double the recipe and make an entire dozen. What if my Egg Muffins are sticking to the muffin pan? If you have a nonstick muffin pan in which things tend to stick to, my best advice is to either line them with Parchment Liners (they are wonderful), or buy a Silicone Muffin Pan. The silicone muffin pans are great. You just set the silicone muffin pan on a baking sheet and bake as directed. But the egg muffins pop out super easily. There are never any sticking problems with that sort of pan. The silicone muffin pan works so well that there are actually egg muffins shown in the advertising photo for this pan on Amazon! Can you make egg muffins with egg whites? Yes, you can make egg muffins with egg whites. If I’m using egg whites, I actually like to use half egg whites and half whole eggs. There is a good amount of protein in the whole egg, so I don’t like to miss out on that! 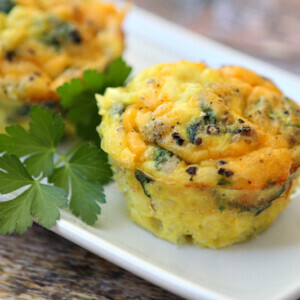 Enjoy these healthy Egg Muffins, and kick-off the weekend in a delicious way! I got my original inspiration for these egg muffins by taking a peek at The Lemon Bowl’s Ham and Cheese Baked Egg Cups. 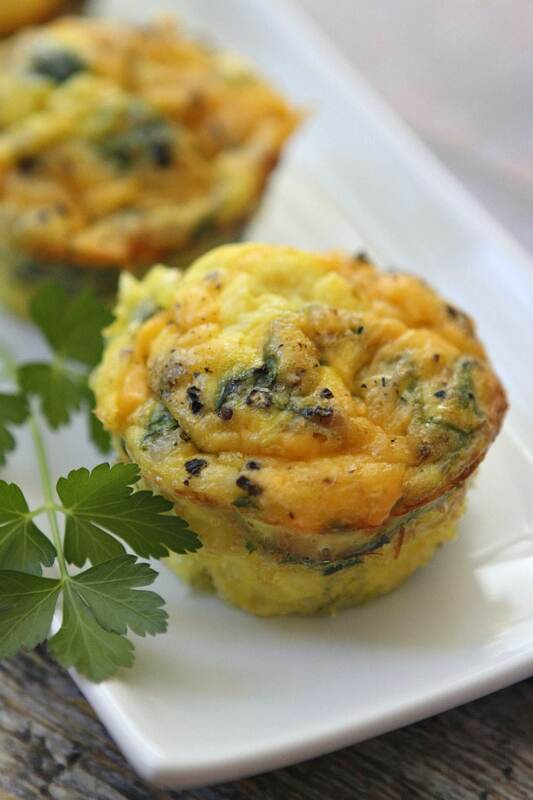 These healthy egg muffins are an easy make-ahead breakfast recipe. Spray a nonstick skillet with nonstick spray, and quickly cook the spinach- just until wilted. Let it cool, then squeeze any excess moisture out of it. 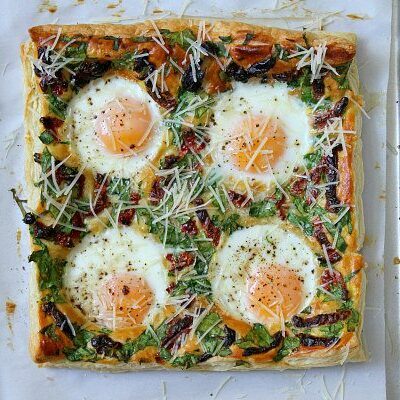 In a medium bowl, whisk together the sausage and spinach with the eggs and milk. Scoop into the prepared muffin tins (I find it easiest to use a 1/3 cup measuring cup) almost to the top. Sprinkle cheese on top. Then give each one a good dose of salt and pepper. Bake 25 to 30 minutes, or until the egg is cooked through. Easy way to check the egg: touch the middle of the muffins... if they are still wet and gooey, they'll need a little more time in the oven. They should feel cooked through. Serve the egg muffins immediately- with salsa, if desired. 1 WEIGHT WATCHERS Freestyle SmartPoint per muffin. Jimmy Dean already-cooked turkey sausage crumbles are perfect for this recipe. 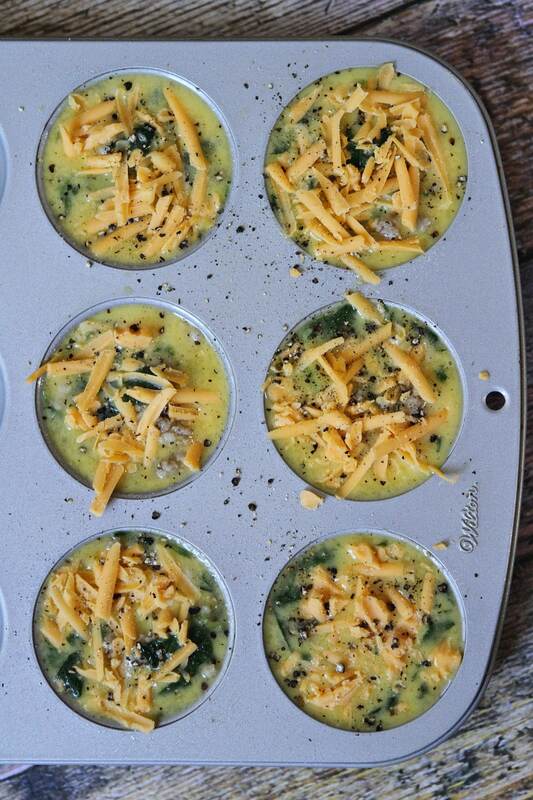 Egg muffins are pretty versatile- sub in other ingredients for the sausage and spinach, if you prefer. This recipe was originally published in 2014. It was edited and re-published in 2019. A few years ago, you posted a simaler egg muffin recipe that called for crumbled sweet Italian sausage -rather than the turkey sausage. Do you still have that recipe? I can’t find it – and really like the sweet taste of the sweet Italian sausage. 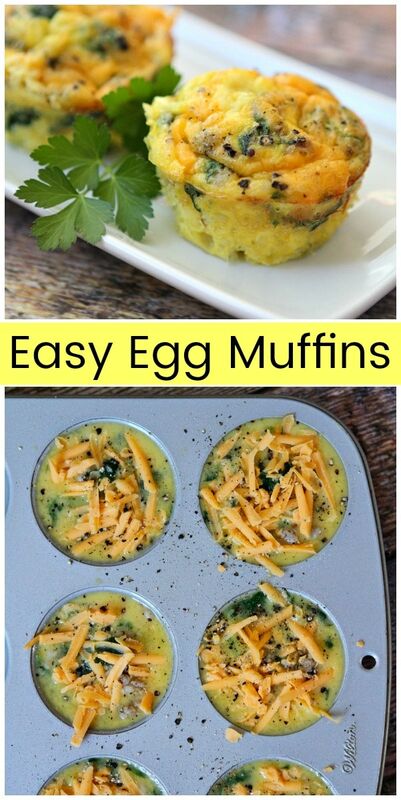 Love the egg muffins. 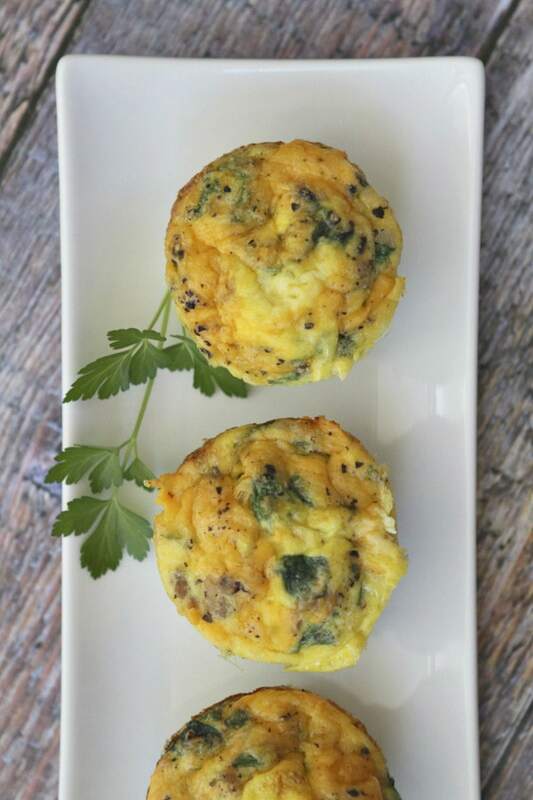 This is the only egg muffins recipe I’ve posted, but you can certainly use sweet Italian sausage in this recipe as it’s pretty easy to put in whatever you want. Such an amazing way to start my day! Perfect for busy mornings!